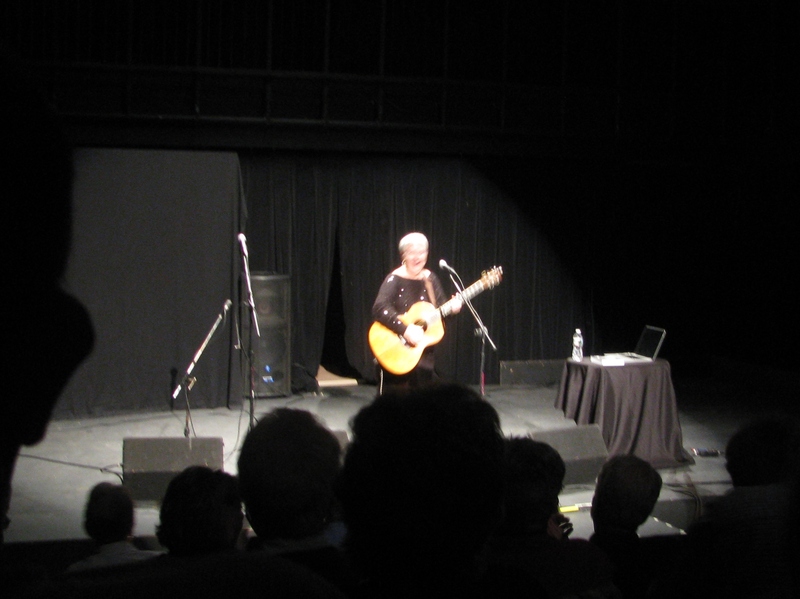 Singer/songwriter/comedian Christine White was warm, witty, and delightful last Saturday evening (November 3) at Cotuit Center for the Arts. Having heard her songs on the radio over the years, I expected that, and she did not disappoint. I had not heard much of Don White, so did not quite know what to expect. 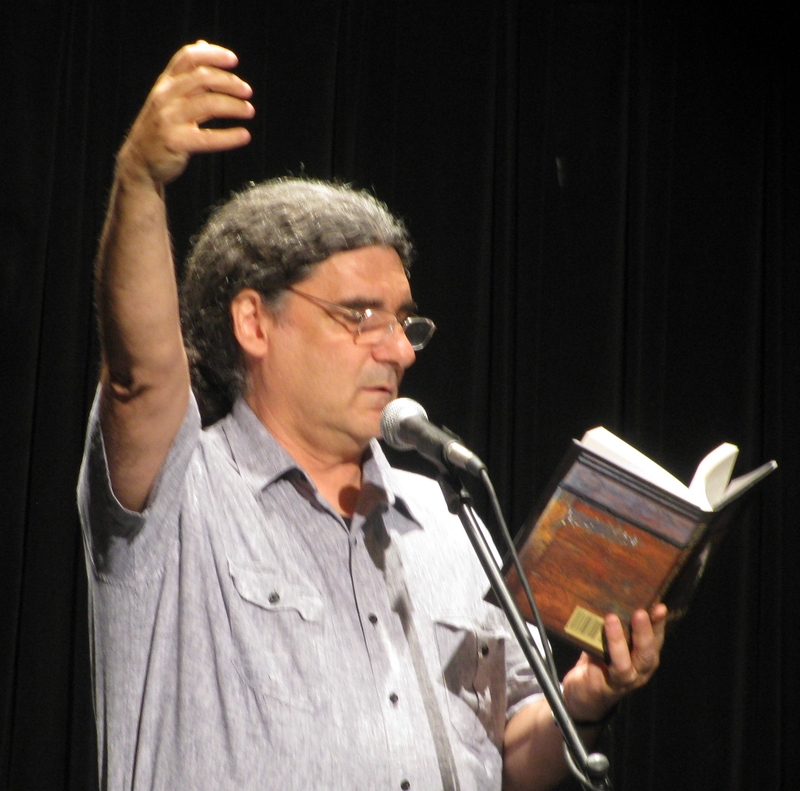 He was terrific, at his best telling long stories, true, but embellished, like Lavin’s, and singing from the heart. It was a very friendly and entertaining evening, all the better experienced in the center’s intimate performance hall, surrounded by art galleries. 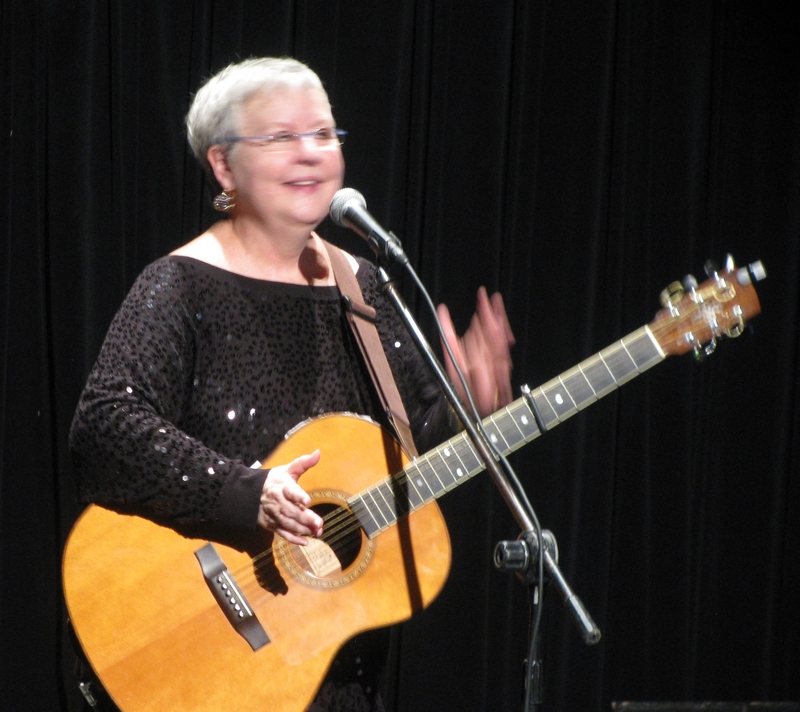 Dressed in black velvet pants and a sparkly black top, Lavin began the show with a computer-embellished song consisting mainly of the words, “I am here in Cotuit, Massachusetts on a Saturday night,” which would have been better if she hadn’t mispronounced “Cotuit” as “COH-tu-it,” but was appreciated by the audience anyway, who laughed each time, perhaps thinking the mispronunciation was intended to be funny. She involved the audience in some dance moves, starting with finger exercises, and ending with having us stand up and follow her in some lively swaying and clapping. “Don’t you feel better?” she asked. And we did. Lavin is cheerful, with a youthful attitude and voice, and she ties her songs together with personal stories and jokes. Her songs are quirky takes on her life and travels, with honest commentary on social and political affairs: trading places with a fly on a plane, response to a sleep-depriving overabundance of wind chimes in Hawaii, an examination of recent research about how we are hardwired to be liberals or conservatives. 1. Could you slap your dad on the cheek, with his permission, as part of a comedy sketch? 2. When you go into work in the morning, do you often leave your house a bit of a mess? 3. Which lesson is more important to teach a child, kindness or respect? 4. Do you get bored debating abstract ideas and political conundrums? 5. Do you agree that “Cleanliness is next to godliness”? If you answered “Yes” to 1 and 2, “kindness” to 3, and “No” to 4 and 5, then you are a liberal. These are the fun and curiosity answers. If you answered “No” to 1 and 2, “respect” to 3, and “Yes” to 4 and 5, then you are a conservative. These are the safety and security answers. Nearly all of this was sung—a memorable way to explain a bit of very relevant political research. Lavin also read from her book, “Cold Pizza for Breakfast, a Mem-wha?” (2010), which she said she wrote because her friend Don White had written a book. It was a humorous tale about acting in a celebrity fundraiser that Paul Newman was hosting. It was funny, but I think Lavin is at her best when telling a story directly to the audience, rather than reading. The text captures her sense of humor and her style of speaking, and the book (which I have not read) is probably an enlightening one about the life of a touring folk singer/comedian, but while she is on stage, I would rather hear the story directly from her. 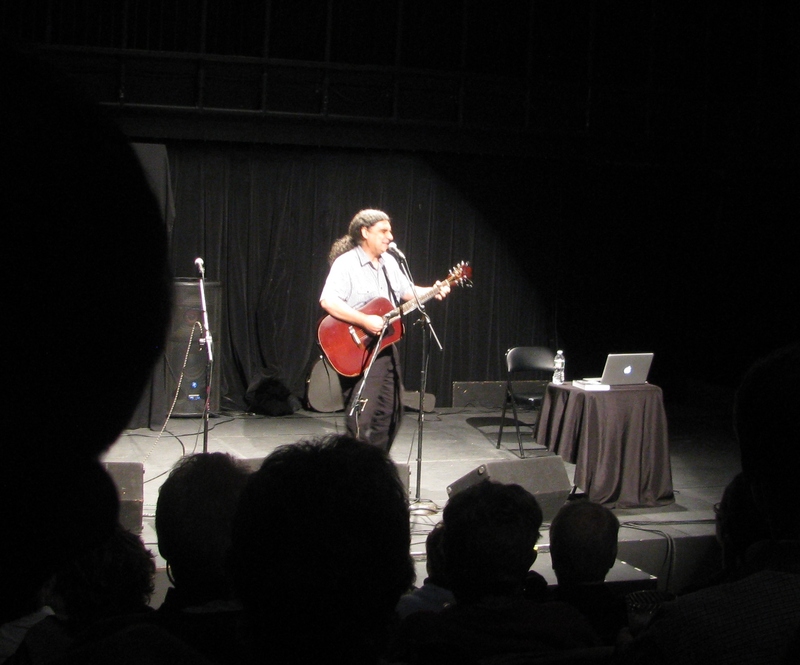 Lavin turned serious for a song about gun violence, dedicating it to her friend Elizabeth Edwards who encouraged her to perform it. “Since 1968,” she told us, “the number of Americans killed by guns—stuns.” “More than one million Americans killed by guns,” the song goes, including murders, accidents, and suicides. And that number continues to rise. Turning back to silliness, she sang “What Was I Thinking,” one of her most frequently heard tunes, and “If You’re Drunk, You Cannot Buy a Puppy,” a cautionary song inspired by a sign she saw in a pet shop. She changed the pace with what she called the saddest Christmas song ever written, “A Christmas Guitar,” written by folk singer/songwriter Megon McDonough, about the healing power of music, after the deaths of her father and sister. After intermission, Don White shared his own humorous songs and stories. White used to be a stand-up comic, but quit because, “there was too much money in it.” He is an appealing comedian, telling stories and singing songs about his life and family, colored by his working class Lynn, Massachusetts, background, and his down-to-earth views on life. Simply dressed in a casual shirt and pants, he looked like he was just out entertaining friends. White does have a lot of heart, and he is really funny, whether telling tales or singing songs. 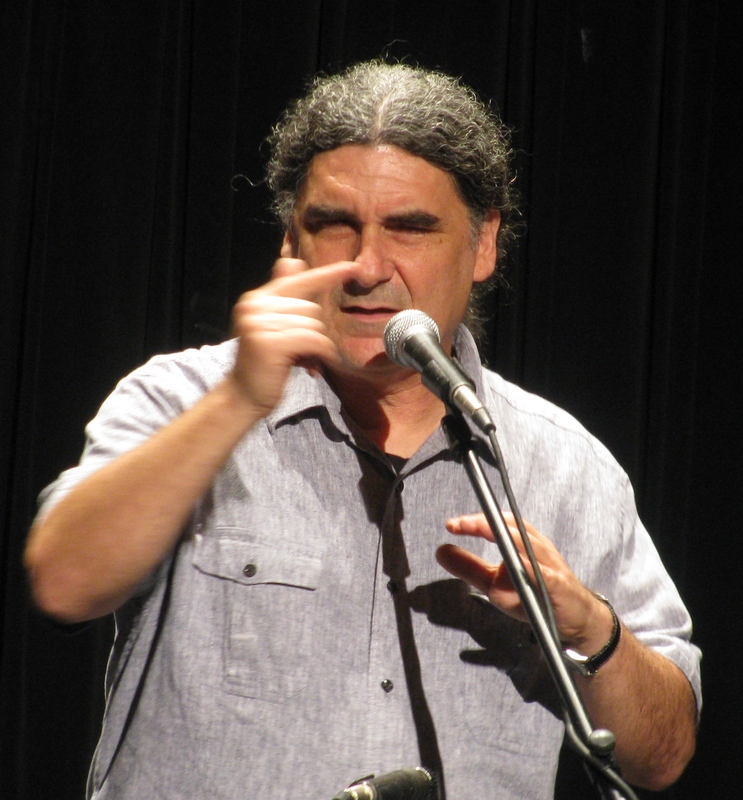 He knows how to tell a story, and his reading from his book, “Tales of a C Student,” was hilarious, not so much for the content, comparing his Greek and Irish relatives, but for his ability to tell a tale with flair—even if he is reading it. White told funny stories about having a high blood pressure, a heart attack scare, and marital discord. He described what his wife watches on TV, “the crying woman’s channel,” where it seems there is always a woman crying about something. But White loves his wife and respects women. He told a story about wiping away tear drops from his wife’s eyes as she awaited gall bladder surgery, and sentimentally keeping the tissue. He followed the story with his popular song, “I Know Exactly What Love Is,” sung a cappella. I have heard this song before and, to be honest, never really liked it. It is too sentimental for me. But, hearing it live, in White’s honest working-class Lynn accent (giving the word “real” given two syllables) and deep resonant voice, would bring a tear to anyone’s eye, and the audience agreed, rewarding him with long, sustained applause. White responded by praising Cotuit Center for the Arts for its wonderful performance facility, “I’d like to have this in my town,” he said. 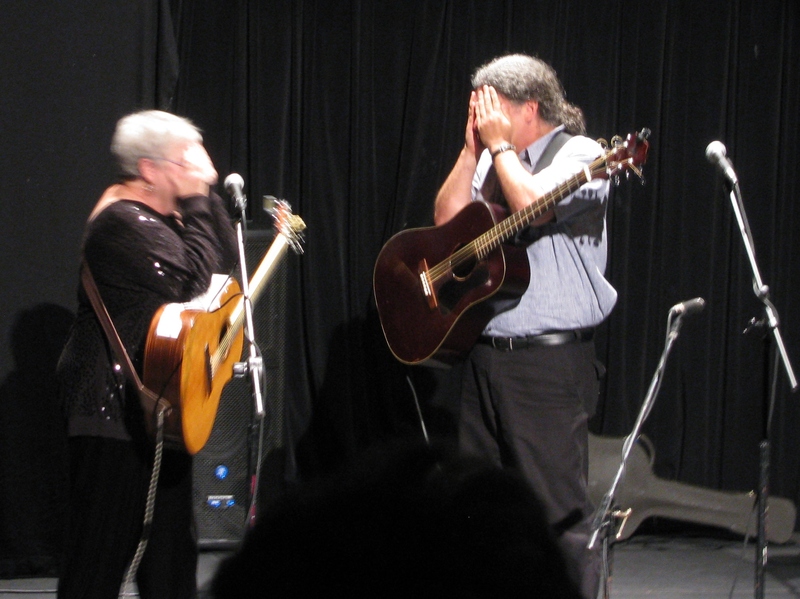 Christine Lavin and Don White cover their eyes, pretending they have gone backstage and will be called back soon for an encore. For the finale, Lavin joined White on stage, and they took turns presenting songs, joining forces on some. White sang “I’m from Lynn” (“People from Lynn just act this way.”) Lynn, he told us, is the home of Marshmallow Fluff. Lavin sang “Good Thing He Can’t Read My Mind,” about a woman pretending to like things like sushi and opera for the sake of a loving relationship, and White sang some verses she had written for him, about going shopping and to craft fairs and chick flicks to please his wife. 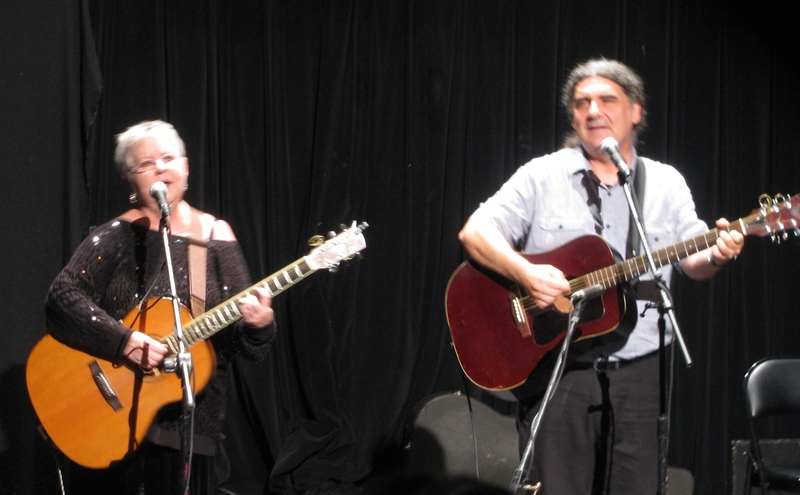 Lavin and White ended with the traditional folk song, “Goodnight, Irene,” suggesting that we pay attention to how many verses are about killing yourself (“Sometimes I live in the country; sometimes I live in the town, sometimes I take a great notion to jump in the river and drown.”). “Sensitive New Age Guys” is kind of a dated concept, but it was fun to see the men on stage, and it was a nice ending to a very enjoyable show. Cotuit Center for the Arts provided a perfect venue; the sound was just the right volume, the seats were comfortable, and everyone had a good view of the entertainers. We could buy wine, beer, and other alcoholic drinks, soda, water, and a variety of snacks. The current art shows offer a feast for the eyes: “Water and Sky, Recent Paintings by Jennifer Day” (large black-and-white paintings of the sky and the ocean, clouds and rain); “Shades of Gray” (a juried show of mostly black-and-white works by local artists); and a display of Raku pottery by local potters. The exhibits are on display until November 17. For more information about events, exhibits, and classes at Cotuit Center for the Arts, visit artsonthecape.org.